Just wanted to let people know about another set of free Korean literature e-books put out by the great people over at Literature Translation Institute of Korea (LTI). Unlike the last set, which focused on the modern period, this new set has short stories from many contemporary authors. The new group is called "New Writing From Korea" and can be found here. Included in this new offering are authors such as Park Min-gyu, Kim Aeran, Kim Insuk and many others. You can find reviews of many of these stories at Charles Montgomery's fantastic ktlit website. In addition, Tony Malone of Tony's Reading List has spent the past year reviewing numerous Korean lit. short stories, novellas and novels. In other Korean literature news, ASIA Publishers has recently released their newest set of Korean fiction. You can read about the new set, called K-Fiction here. Charles has also started reviewing the books from the series at his site. Here is a link to his review of Park Min-gyu's "Dinner with Buffett". They have also put out numerous sets of their "Bi-lingual Edition Modern Korean Literature" series, so you should check those out if you haven't. If that isn't enough for you, Dalkey Archive Press has released another five titles in their Library of Korean Literature Series. You can read a review of Ch’oe In-ho’s ANOTHER MAN’S CITY over at asymptote journal. Over at LIT's site, they have information about the 5 new releases and the previous 10, in case you missed them. The books included in this set are: “Pavane for a Dead Princess” by Park Min-gyu, “The Square” by Choi In-hun, “Scenes from the Enlightenment” by Kim Namcheon, “Another Man’s City” by Ch’oe In-ho and “The Republic of Užupis” by Haïlji. On a final note, you can find more free stories from some of the above mentioned authors and one from Kim Young-ha here. This will be a short post, but I wanted to let people know about this wonderful new source for free Korean literature e-books (short stories and novellas). Literature Translation Institute of Korea (LTI) has just made available (for free) 20 works of Korean fiction. The stories are by some of the giants of early modern Korean literature, including Yi Sang, Kim Nam-Cheon, and Chae Man-Sik. The works span from the early 1920s to the late 1940s. Many of these are very well done, new translations. The titles can be found and downloaded here. For the tech savvy among my readers, they have also put out an iphone app, which can be found on itunes. As usual, our friend at KTLIT has a great piece up about it, which can be found at his site. The piece is a round table discussion about the current status and future of Korea literature. The panelists included Charles from KTLIT and current Royal Asiatic Society-Korea Branch President Brother Anthony of Taize. I know I haven't posted in a while, but I've come across a few things that I wanted to share. In other news, the great people at Dalkey Archive Press have begun releasing their Korean Literature series. They are releasing lots of new and great material. Hope to get up another Korean literature related post in the next few weeks. As always, questions and comments always welcome. As my first Korean literature post has been one of the most viewed, I have decided to do a follow-up post and recommend a few more titles. For those of you interested in reading more Korean literature, I would like to recommend a great series of novellas and short works called The Portable Library of Korean Literature by Jimoondang Publishing Company and KLTI (Korean Literature Translation Institute). Each book contains a selection of a few short works by a selected author. Once again, we have Charles at KTLIT to thank for a full list (and reviews) of the series here. This story relates a day in the life of an advertising salesman in the late 1980's in Seoul. A story centering around a young girl and her experiences living in Incheon just after the Korean War. I really enjoyed the second story The Wayfarer as well. Set in Venice, the story of a man on a business trip in search of a long-lost friend. By clicking the author's name, in addition to a short biography, you will also find her story The Flower with Thirteen Fragrances. A mysterious young man with a seemingly secret past begins to disrupt the atmosphere of a group of writers at their favorite hangout. One in the group makes it his mission to discover the truth. Another foreign setting, this time California, follow two Korean ex-pats on a road trip, Kerouac-style. For those of you who are looking for something larger, but are still relatively new to Korean Literature, I would recommend the below anthology. The Wings (Yi, Sang) - Same story mentioned in the previous post. The Crow (Yi, Tae-jun) - A story of unrequited love. Mother's Hitching Post (Park, Wan-suh) - One of the most famous modern Korean authors. Another Man's Room (Choi, In-ho) - Same author as the above mentioned Deep Blue Night. I plan to read The Dwarf by Cho, Se-hui pretty soon. I've read two stories from it already that were very good, so I'm looking forward to reading it. Hope you find these recommendations helpful and that they have given a little more of a selection for those interested in Korean literature. I am by no means a sushi expert, but I have spent a lot of time searching for books about sushi. I love eating sushi, and I am also interested in reading and learning about it. This is not a list of sushi recipe books, it is a collection of books about sushi. No doubt, countless pages have been written about sushi in Japanese, however, comparatively very little has been writen in English (especially considering its still increasing popularity). When I search for books about sushi, I usually find that most of them are about how to make sushi or sushi recipes. Below is a list of books ranging from small, simple books with pictures of sushi and names in both English and Japanese, to books about its history and the evoloution of the sushi industry. I will not be writing reviews of the books (as I do not usually read reviews), but will give a short description of each and provide links to reviews for those of you who would like to read them. Really a pocket guide, this is a very small book (both size and length) that gives some basic information about sushi and the sushi experience. It includes color photos and very short descriptions of about 50 different kinds of sushi (Nigirizushi & Makizushi). It also has the name in Japanese and how to pronounce it in English. A small bilingual (Japanese & English) book (slightly bigger then the previously mentioned one) about sushi and eating at a sushi restaurant. This book includes about 40 different kinds of sushi and provides some background information about the fish and when it is in season. This book also includes photographs of the sushi it mentions, some common side dishes at a sushi restaurant and a very short list of expressions used at a sushi restaurant. This book is a beginners guide to sushi written in the early eighties. It is under 100 pages and contains color photographs of numerous types of sushi, including nigirizushi, makizushi and Kansai-style sushi. Additionally, it has some basic information about the history of sushi, the sushi bar and etiquette for eating sushi. This is a long and very detailed book about sushi. The beginning has a short history and descriptions of the main types of sushi and basic ingredients for sushi. The bulk of this book is dedicated to giving very detailed information about various sushi toppings, including: background information, history, lore and why some toppings and kinds of fish are know by multiple names. There are no pictures or photos and no Japanese characters are used. Corson's book gives a lot of information about sushi, especially its history, while following the story of a group of students at a sushi academy near Los Angeles. He traces sushi's origins back to the Mekong River and looks at a number of important events in its development. This book gives readers a behind the scenes glimpse at a type of sushi training in the US, as well as a wealth of knowledge about sushi. This book focuses more on the modern history of sushi as a global industry. It is about the business side of sushi and looks at some global and environmental developments and issues concerning the industries related to sushi. This volume is taken from a very famous Japanese comic book (manga) series about food. Presented like a children's book with watercolor pictures related to sushi and a sushi restaurant. Has information and translations of Japanese phrases that would be encountered and useful at a sushi restaurant. A sushi chef's memoir that follows his story from his early days training in Japan through his move to Seattle, Washington. The book also contains many photographs (not just of food) and some of his recipes. It's a good counterpoint to Corson's book. A non-fiction account of the author's culinary trip to Japan with his family. This book is about Japanese food, but has some information about sushi. An introduction to Japanese food, it includes one chapter on sushi. Trevor Corson's website has even more information about sushi and some of his articles on the topic. Okay, so I've included more than just books. I hope that you find this information useful and if anyone knows of any other books on sushi in English (of which I'm sure there are many) please feel free to leave a comment. In this post I would like to make a few Korean literature recommendations. While more and more is being written about this topic, it is still sometimes a little difficult to know where to get started. I am not an expert by any means, for that I will direct you to Charles Montgomery of KTLIT. His site offers the most information about K-Lit (in translation) I have seen in one place, including reviews, news and author interviews. I would, nonetheless, still like to suggest a few selections. As someone who tries to avoid reading reviews of books before I read them, I am not writing reviews here. I will however give a very short description of each work and have provided links where you can read a little more about each author and work if you wish. Korean noir detective fiction and the most recently written of my recommendations. You can find a review here. More dectective fiction: A man is dead. Two men are investigating, one a detective, the other a writer. Was it murder or suicide? Who will uncover the truth first, and why it happened? The oldest of my selections and the story of the possibly insightful rambalings of a tomented husband (think Dostoyevsky's Notes from Underground). A rich text, lending itself to various literary interpretations. Charles of KTLIT has a full review here. All three recommendations are novellas or (longer) short fiction. Both "Photo Shop Murder" and "The Wings" are exteremely inexpensive and come with additional short stories. The General's Beard can also be purchased online, but the link I provided is to the complete story, from the translator's own site. I hope that people enjoy these recommendations. If you have already read these or would also like to recommend something, please feel free to leave a comment. Additonally, if you liked these and would like me to make more recommendations, just ask, as I may add to this list in the future. 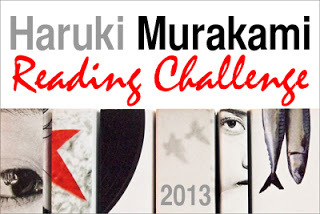 This is the first reading challenge that I have joined, and as I usually read a few Murakami books every year, it seemed a natural choice. I first became interested in Murakami through the film director Wong Kar-Wai. I mentioned him in my guest post on January in Japan as introducing me to Osamu Dazai. I have to credit him once again for bringing another giant of Japanese literature to may attention. Many years ago, in the course of my so-called research about Wong Kar-Wai, I came across the information that Murakami's short story "On Seeing the 100% Perfect Girl One Beautiful April Morning" was an influence for his film Chungking Express. You can read more about the connection here and here. While I guess 5 books puts me at the Toru level of participation, I will graciously decline that level and remain at the Sheep Man level, which I believe is more fitting. Speaking of the Sheep Man, thanks to Tony of Tony's Reading List, I ran across the story "The Sheep Man's Christmas" on a post at brilliantyears, with a link to a translation here. Will have to add that one to the challenge too. So-called research about: books, travel and food.